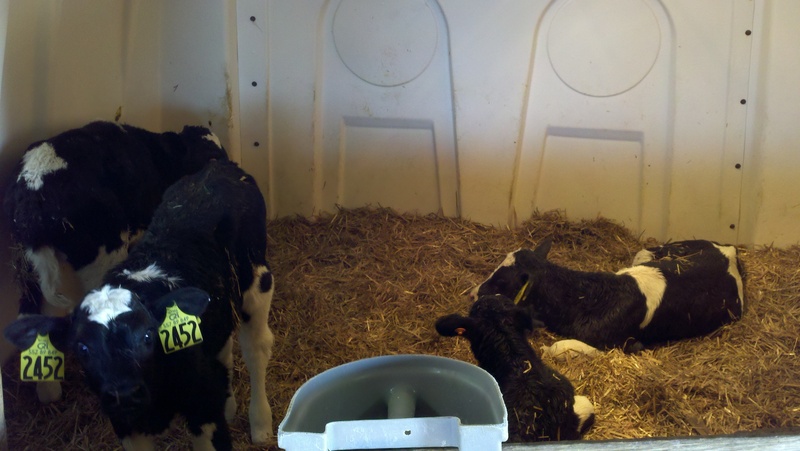 I took some pictures today to show what we do with calves after they come out of the warmer pictured in the last post. First they go into a large hutch with a heat lamp inside the maternity barn. We keep the calves in one of these hutchs for a couple of days until they are drinking vigorously from the buckets. Most of the bull calves are sold with in a couple of days of being born, so most of them get sold from these hutchs before they go outside. Next we move the calves outside in groups of 4. They have a large hut and a corral outside. If it is cold, we put coats on them. This is hopefully the last group that will need coats this year! They probably didn’t need coats, but we error on the side of putting coats on. 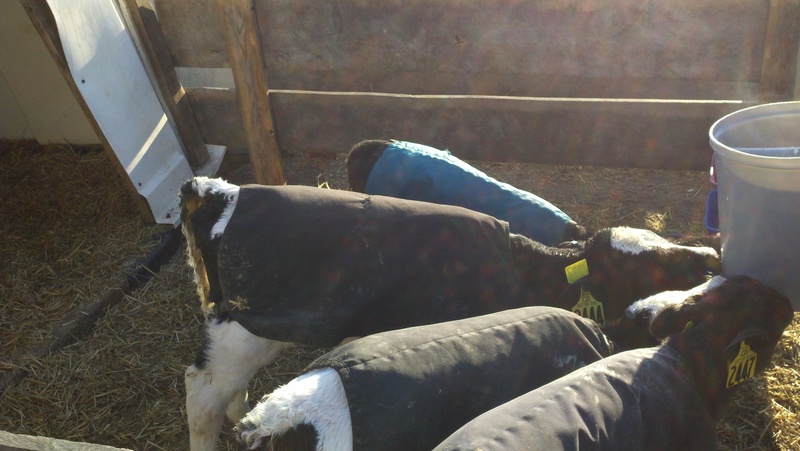 The calves could do fine with out the coats, but they would need to spend more energy staying warm. We would rather have them spend energy growing and fighting off any possible disease. We feed them milk out of these buckets for 6-8 weeks. We also feed them grain. Once they are eating grain good we start to wean them off of the milk. They need to be eating grain at this point so that their rumens are developing. If the rumen isn’t developed, the calves will lose weight after weaning, so we try really hard to make sure that they are eating grain before weaning. We used to raise calves inside of a barn and try to keep the barn warm, but we had to many problems with pneumonia. We have had better luck raising the calves outside year round, feeding them a bit extra and giving them coats. Once the calves are weaned, they are moved to a large pasture where they are feed hay and grain. They are moved into bigger and bigger groups until they are bred and ready to come back to the barn for milking! 9 Responses to Calves Continued. Good writing Will. So many people, especially city folk, seem to think that farm animals are mistreated. Oh, that anonymous post was me. Yeah, in particular people think animals on larger farms are mistreated. The reality is we take better care of our animals then the vast majority of people take care of themselves and their kids! With all the calving, are you trying to grow you milking population or is milking 330 the sweet spot and you are calving to manage turnover? Well, I probably over estimated the number of calvings a little bit. Particularly right now we are way down on calving because of a bull that quit doing his job! We actually usually have more calves then we need thanks to a good fertility program and a good calf raising program. The last couple years we sold 40-50 milking cows because our barn was to full, (330 is pretty much what our barn can hold) on top of that we have been able to cull much more aggressively. That way we can get ride of any bad cows as we have quality replacements coming in. Right now unfortunatly we don’t have enough calves coming in….probably down to 2 a week or something. But normally we would be up closer to the one a day. Come July we are going to start getting swamped with calves because of the back up problem we had with the bull. We will need those to fill the barn back up, cow numbers have gone down a bit because we haven’t had a new heifer come fresh (have a calf) since last summer! We ended up AIing (artificially inseminating) a bunch of heifers and buying an extra bull to get caught up. Keep in mind that roughly half of the calves born are bulls, so only about every other calving is a future cow. So i guess the answer to your question is that we actually have extra calves. We breed our cows at an optimal time for milk production, not necessarily because we do or don’t need calves. There are farmers that don’t have that luxury of having to many calves…..those are the guys we would normally end up selling replacement heifers or cows to. The average number of lactations for a dairy cow is right around 3 across all farms. So doing the math if you figure on losing a couple heifers before they get to be cows, you can see why some people are running shot of replacement heifers. We average up around 4 (might even be a bit higher) so that is why we are having extra replacement heifers. There may be a time in the near future where we will be using those extra calves to increase our herd size with out having to buy any cows…. Having a closed herd (where you raise all your own replacements) is a great way to keep your cows healthy- no dragging other people’s sicknesses in among your healthy animals. I’m really enjoying the posts! Makes me homesick for a dairy farm! !